Jellyfish range from the size of a thimble or the eraser tip of pencil to approximately 8 feet in diameter and tentacles that reach 200 feet. That is as long as two blue whales. The type of jellyfish most seen on the shores of North America and Europe is the Moon jellyfish. 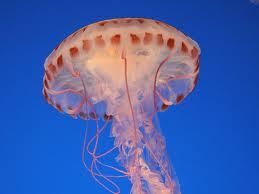 This type of jellyfish is typically blue or pink and is found in waters approximate 20 feet (6 meters) deep. Its sting is usually mild, but can leave an itchy, red rash. In the 2008 movie Seven Pounds, the character Ben Smith, an IRS agent played by Will Smith, commits suicide by sharing his bathtub with a deadly jellyfish. The title refers to the “seven ponds” of flesh Will Smith gives to other people to make up for killing seven innocent people in a car accident.